Tension prevailed in the Posco project area in Jagatsinghpur district on Thursday as hundreds of agitated villagers came out to oppose digging of a trench for construction of a boundary wall along the land acquired for the proposed steel plant. The digging of the trench and demarcation work was carried out by the administration at Mangalapada, Gobindpur and Patana Haat despite the people’s opposition. Two betel vineyards were demolished and more than 150 trees were felled by the administration even as the villagers staged a demonstration under the banner of Posco Pratirodh Sangram Samiti demanding that the work be stopped immediately. The betel vine owners were paid compensation amount on the spot. But the trench that the administration had dug up along the land acquired for the project was filled with mud by the villagers after the administration returned from the spot, according to Prashant Paikray, spokesperson of the Sangram Samiti. Mr. Paikray questioned the administration’s work of digging the trench and felling of trees saying that it was illegal since the environment clearance granted for the project by the Centre in the past had been suspended by the National Green Tribunal last year. He said the administration’s move would be opposed tooth and nail again on Friday. According to sources, the administration planned to complete acquisition of 2700 acres of land for Posco within a few weeks. The company brought down its land requirement from 4004 acres to 2700 acres as the administration found it difficult to acquire land in Dhinkia village due to stiff opposition from the locals. As per its changed strategy, the company plans to establish a steel plant with an annual production capacity of eight million tons over a land of 2700 acres instead of establishing a 12 million ton per annum capacity steel mill over 4004 acres of land. Moving ahead in its land acquisition spree for the Posco project, the Jagatsinghpur district administration aims to complete acquisition of 700 acres of land for the mega steel project in a week. The state government has already acquired 2,000 acres of land for the Posco project. In the current phase of land procurement, an additional 700 acres were to be acquired. This is necessary since Posco India had sought at least 2,700 acres of land to commence construction activity on an eight million tonne per annum (mtpa) steel mill in the first phase. The proponent would later ramp up output to full scale 12 mtpa on receipt of its full land requirement of 4,004 acres. “We expect to complete acquisition of 700 acres of land for the Posco project in a week. Close to 600 acres have already been acquired. Trenching work for boundary wall construction is also going on at Gobindpur”, sad Jagatsinghpur collector Satya Kumar Mallick. Recently, the land acquisition drive for the Posco project had suffered a setback when villagers opposed the process, alleging massive irregularities in measurement of vines. The affected people also objected to starting trench cutting necessary for commencement of boundary wall construction for the steel project. 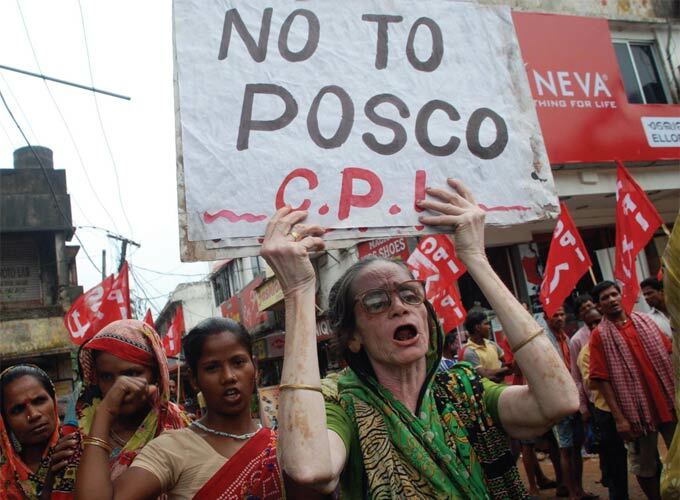 The pro-Posco villagers alleged that the company authorities and officials of Odisha Industrial Infrastructure Development Corporation (Idco) have started trench cutting process for erection of boundary wall for the project without finalizing compensation, fixation of land rate, job opportunities, identification of betel vine labourers and other issues. In a recent status note prepared on the Posco project, the state government said it has already handed over 546 acres to Posco India. An additional 1554 acres were ready to be handed over to the company. Posco India needed 4004 acres of land in all. The land was to be acquired in eight villages- Nuagaon, Dhinkia, Noliasahi, Gobindpur, Polang, Bayanalkandha, Bhuyanpal and Jatadhar. The state government admitted that law and order problems at the project site and delay in obtaining approval of forest diversion from the Union ministry of environment & forest (MoEF) impeded progress in project implementation. While according approval of forest diversion for 2959 acres of forest land, MoEF did not appreciate the swapping clause of the original MoU (memorandum of understanding) signed with the steel major that expired in June 2010. Hyderabad: Revenue minister Raghuveera Reddy has warned that those who have occupied SC,ST lands and not handed it over will be booked and sent to prison. The minister made this statement at the revenue conferences in the state Assembly on Tuesday. He said 4.5 lakh acres of SC,ST land have been occupied in the state by others and 2.5 lakh acres were recovered and returned to the community. The remaining land will be recovered and returned to the SC,STs. In the seventh and final phase of the land distribution programme, the government will distribute every acre of land fit for cultivation. So far, 75 lakh acres of government and forest land were distributed among SC, STs. The minister further said, 4.7 lakh petitions were received in the ongoing revenue conferences that started on March 21, and 1.26 lakh petitions were cleared on the spot, 5,996 petitions were rejected and the remaining were under process. Petitions will be cleared in 90 days, the minister assured. Commenting on the Minister’s statement the Opposition members expressed their objection on conducting of revenue conferences when the Assembly was in secession. Reacting to this the revenue minister said, so far except three to four ministers, all the ministers, and 70% of the MLAs participated in the revenue conferences. The conferences will continue till April 10, so that the MLAs can participate as Assembly Session will be is over, the minister said.